I am in love with Wordle, a site that makes tag clouds out of any text, including del.icio.us links. 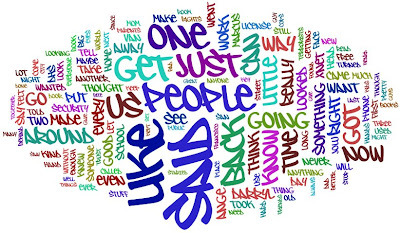 For instance, the above is the tag cloud for the YA book Little Brother by Cory Doctorow (if you click on the link, you can read the whole book ONLINE for free!). Scott Westerfeld, author of the Uglies and Midnighters series calls the book "A rousing tale of techno-geek rebellion, as necessary and dangerous as file sharing, free speech, and bottled water on a plane", while Neil Gaiman blurbs on the front cover: "I'd recommend Little Brother over pretty much any book I've read this year." Since Westerfeld and Gaiman are some of my favorite authors, I am going to start reading this one as soon as possible!